This photo was taken at the back of Tetley Row, now demolished. My Grandparents Isaac and Elizabeth Monkhouse lived there from 1924 to 1932. They lived in two back to back houses made into one. No. 3 Tetley Row backed on to No. 7 Main Street. The photo was taken in 1927 on the occasion of the marriage of their eldest daughter Maggie to Hume Pollock from Canada, before she emigrated to Canada. The van belonged to the local Baker Mr. Horace Akrigg who was providing the goodies for the celebration. 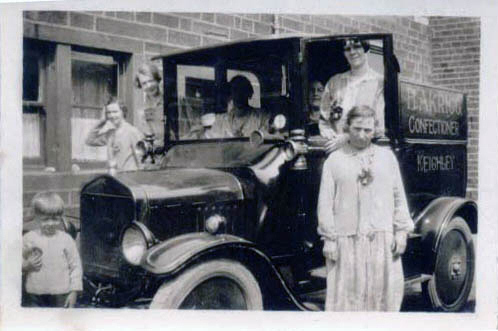 From left to right around the van are:- Toddler Kenneth Seward, a cousin Agnes Sandham, Dorothy Dixon, Mary Agnes Dixon (Grandma's sister, who owned the house on Tetley Row), Evelyn Seward (Sister in Law), Peggy Dixon and Alice Seward (Sister in Law). H. Akrigg Bakers and Confectioners was based at 57A Oakworth Road, Keighley. The business partnership between Horace Akrigg and Emma Harrison was dissolved on 6th November 1945.